The LyoCapsule freeze-dryer was specifically developed with SP Scientifics’ mission to provide Line of Sight scale-up equipment and technology, from R&D through to commercial freeze-drying. 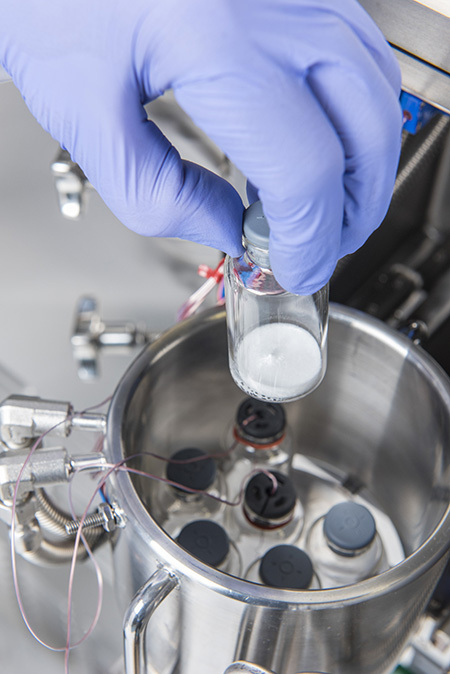 Addressing early stage development challenges, with only very little and costly active pharmaceutical ingredients (API) available, is another commercialization hurdle to overcome. Line of Sight technologies enable the development of the freeze-drying cycle with just 7 vials of product and a small amount of API using the LyoCapsule. Every additional trial provides more data to expand the understanding of the products characteristics. Compared to traditional approaches using a full shelf in a larger dryer, typically of 200 vials, development now uses less API, less preparation time, increased development capacity, and more importantly the same level and quality of data to support process and product understanding for product life cycle management. Please note: This recorded webinar is now available to download on this link. Miniaturization of Freeze Drying: Process Optimization in the LyoCapsule Using Innovative Process Analytical Tools (PAT) - Presenter: Alexandra Braun, Ph.D. This recent webinar focused on the applicability of MTM and SMART™ in the LyoCapsule™ freeze dryer in miniaturization of freeze-drying, especially in early development phases. Presentation slides are also available.